Welcome to the Freeola Internet customer support pages. 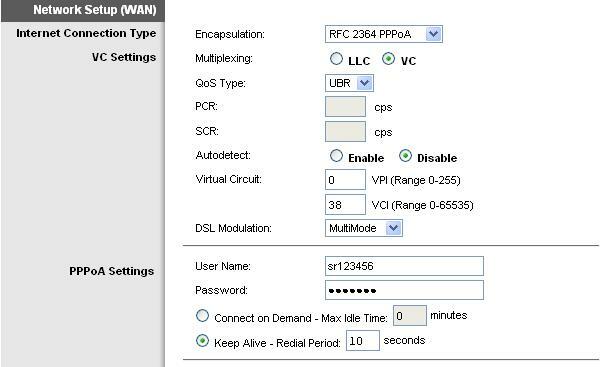 This guide is designed to help with setting up your Cisco / Linksys WAG54G2 Router to work with Freeola Broadband. For more internet help topics please visit our main Support Page. These instructions apply to the Cisco Linksys WAG54G2 ADSL2+ Modem Router. The method and settings may also apply to other Cisco / Linksys routers. On the computer connected to the router, bring up your web browser and enter http://192.168.1.1 into the address bar (If you press the F4 key on your keyboard while using Internet Explorer, you should be taken directly to the address bar). This should open the Cisco software within the router, by default the username and password should both already be set to 'admin' or 'Admin'. If you are unable to login using admin for both the username and password, you may find alternate log-in details on the router label. Within your web browser you should see a screen that displays the current ADSL configuration for your router. Please see the information below, you will need to input these settings into the relevant fields. You should then be asked for you username and password. The username will be in the format of [email protected] for Family and Business Broadband packages, or [email protected] ﻿for Unlimited Broadband﻿.﻿ This should have been sent to you in your broadband welcome pack along with your password. If you do not have these settings to hand, they can be obtained by logging in to your MyFreeola account and selecting Broadband Details & Usage from the left hand navigation. You may then wish to alter the Time Zone Setting further down the page to be GMT: Dublin, Edinburgh, Lisbon, London, this is not essential and should make no real difference to the running of your router if it is not set. Select Save Settings at the bottom of the page to save all of the changes that have been made. Your router should now be successfully setup and ready to use. This can be tested by opening your favourite web browser and visiting the Freeola homepage. If you plan to connect to your router using a cable, then you may not need to read though this part of the guide and your router should already be fully set up and ready to use. On the other hand if you would like to connect to your router using a wireless or WIFI connection, please see below for help setting this up. The settings provided are recommendations and can be altered if they do not suit your needs. The first setting, Wireless Configuration, should be set to Manual. If you know which Network Mode other devices on your home network will be using then you are able to specify this here, otherwise if you leave this set to Mixed you should be able to connect using any of the modes supported by your router. The Network Name (SSID) is the name that your router is referred to when browsing through available wireless access points. You should enter a name that you will recognise later into this field. If you are aware of which wireless channels are already in use in your area then you may need to change the Wireless Channel to ensure that you are not using a channel that is already in use. If you are not sure about this, then you should leave this setting at the default. If you experience intermittent wireless connection problems later on, then changing this setting may resolve the problem. SSID Broadcast should be left Enabled so that your router is detectable by the devices which you would like to connect to the Internet. If you are happy with your settings, you should press the Save Settings button and proceed to select Wireless Security from the Sub Menu below the Main Menu at the top of the screen. You should now be given the option of several Security Modes. From this list, select WPA2-Mixed. If all of your settings appear correct, you should press Save Settings and your router should now be configured for wireless access. In order to confirm that this is working correctly you can attempt to connect to your router using any wireless compatible computer that is within range. For help configuring your computer to access the Internet using a wireless connection, please see the broadband support guide named Connecting to a wireless network.